No matter what cylinder bore material you have extreme wear will occur if dust/dirt is allowed to enter your engine. Your engine can be destroyed in minutes. Always check the airfilter; no holes or tears, it's oiled correctly, fits snugly against the airbox, the airbox to carb seal is airtight. Always follow the manufacturers instructions. Drowned your bike? 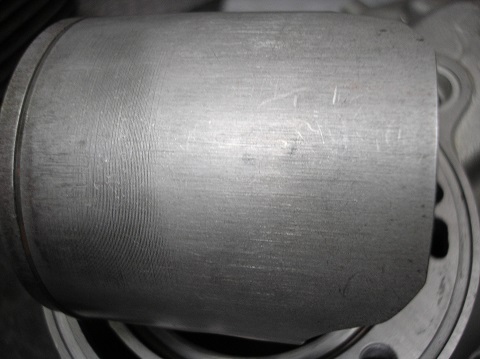 Dirty water can be pulled through the filter; it has been suggested that when water enters the engine it causes the plating to flake off around the exhaust port but when we look at cylinders with this type of damage the plating is still firmly attached but is worn through to the alloy. 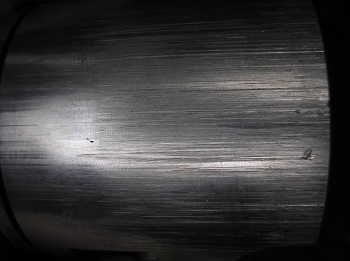 So what does abrasive wear look like? 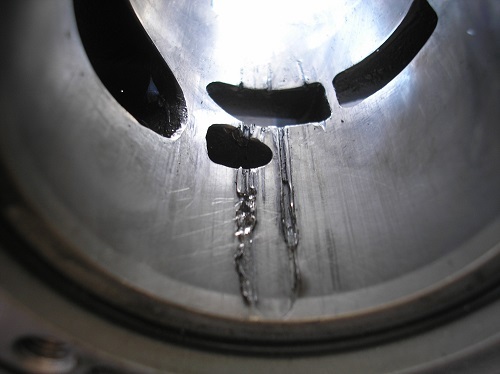 Look for fine vertical scores, the bore and piston contact areas will have a dull lapped appearance. If the ring was chrome plated it is likely that the chrome will be worn through in places; wiping it with a copper sulphate solution will show where the chrome is worn off. 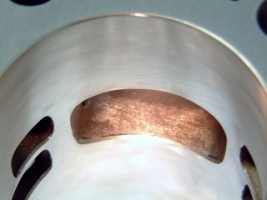 The plating may be worn through to the underlying aluminium around the exhaust port or at the top of cylinder. 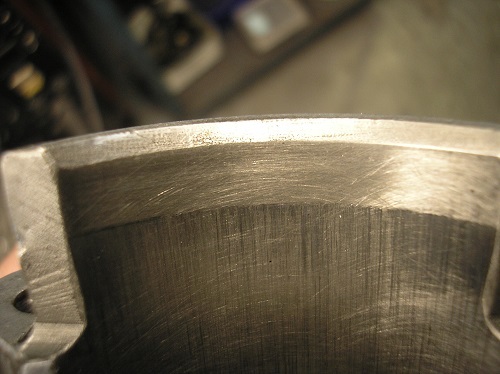 The machining marks on the piston skirt maybe worn smooth. Hi guys - actually its bloody obvious - when they say "under 30 dets in 3 laps" they mean it was 30 dets. The Honda manual recomends 3 dets per Km MAX when ridden FULL OUT,tuned on the edge. Thus to have 30 dets in 3 laps WHEN THEY SHOULD BE RUNNING THE NEWLY REBUILT TOP AND BOTTOM END IN, on part throttle, is simply irresponsible idiocy. That many dets means it has WAY too much advance, or is WAY too lean on part throttle. I have seen this before many times, on engines that are using the kit ignitions or the switchable ignitions that use lots of static advance on the stator. They deto like hell when ridden slowly - as you do when running in, because so much extra advance is wound in down low to get good part throttle response when riding hard. But whilst toodling round at part throttle, they will deto to self destruction in no time. The deto counter is there to tell the rider something is wrong - to keep on shagging the engine with the deto counter rolling over in front of his eyes, when running in is just plain dumb. Pull out some advance, lift the needle, and watch the deto counter, if it clicks over at all when running in - STOP. This cylinder has done 4 hours since a replate. New circlips were fitted but for some reason they were removed and refitted several times during assembly. The circlip broke causing considerable damage. 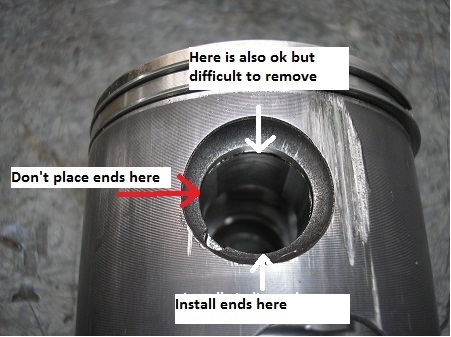 Part of the circlip remained in the piston. Reusing circlips is not recommended however when I asked about the position of the gap the engine assembler said that he had been told to position it away from the removal notch, this means that the gap could have been at 90º to the direction of piston travel. This is a KTM 125 cylinder, I don't know the mathematical equations or have software that calculates the forces on pistons but I do know that the V8s that run in the Bathurst 1000 subject their pistons to 9,000g. Even if a circlip only weighs a gram placing gap at 90º to piston travel will subject it to a closing force of 4.5kg (the other half of the circlip is forced into the groove). This constant flexing will eventually lead to fatigue failure. If you are fitting Seeger style circlips (flat stamped ones with holes in the ends) fit the flat, sharp side to the outside of the piston so that it has the greates bearing area against the aluminium. 1:- Yamaha TR3. This bike is run on methanol. It has only done a few race meetings since the cylinders were replated but has head several new pistons. The cylinders and pistons are scored. Methanol is hygroscopic, because of this the fuel needs to be fresh otherwise the water content will cause the lubricating oil to separate from the fuel. Because of this fresh fuel was obtained for every race meeting and the fuel was dumped after each meeting. As a further precaution the carbs were changed so the engine could be run on a petrol/oil mix to flush out any corrosive products. This posed a tricky question, what is going wrong. Fortunately the owner found his own answer. He had been told to use petrol and any mineral oil as an after-run fuel. In one of those sudden thought moments we all have from time to time he mixed the two fuels. Sure enough, the fuels mixed but the oil separated out. 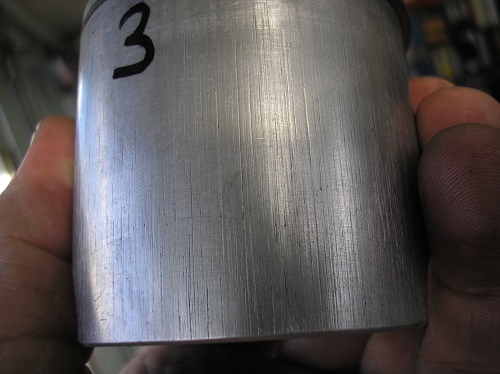 The cylinders were not pretty but until this theory had been tested we did not want to replate them so we honed them. They looked a bit better and in fact are still in use as of 16/7/2015. Click on these images for a closer view. Note the deep scores on the piston. This engine had also had a rebuilt crank, one bearing failed at the same time as the cylinders. 2:- Yamaha TZ750. This bike is run on avgas and an oil designedfor unleaded fuel. It has done a few race meetings but the cylinders and pistons are far from perfect. One cylinder block cleaned up reasonable well after a hone and was only 0.02mm bigger than when we replated it. 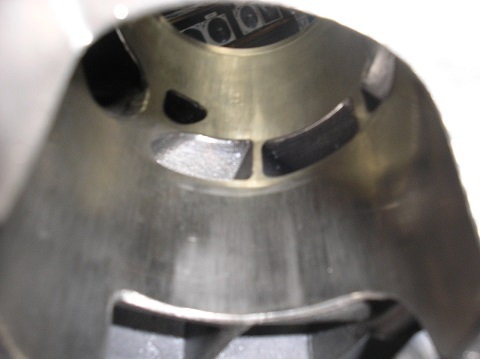 the other cylinder block was replated because it was a little worse but also to prove that the plating is consistent. Once again water is the enemy, apparently it causes this particular oil to separate from the fuel. Don't believe that avgas contains water? Ask a pilot if he drains the water traps as part of his pre-flight checks. This is one of the reasons why the fuel is dumped (sold to us as race fuel) after it reaches a certain age. This oil used in this bike is good provided you take care, I'm not going to name it in public. If you are uncertain about the oil you are using, better still, even if you are sure you should try this test to be sure the oil and fuel are compatable. This test procedure has been supplied to me by a well know two stroke expert. Drain approximately 1 to 2 liters of premixed fuel from the petcock of the fuel tank into a clean glass jar. Vigorously shake the jar. Let it set for about 15 seconds. Is the premix crystal clear or is the premix cloudy. If the fuel is crystal clear, the oil is dissolved in the fuel and can be said the two are mixed and ready to run. Put the premix sample in a refrigerator or lower the temperature of the premix to a temperature that is below the coldest temperature the fuel may experience when riding. Remove the jar containing the premix from the refrigerator and vigorously shake. Wait about 15 seconds and observe the transparency of the the fuel. Is it cloudy or crystal clear. You cannot tune an engine that is trying to run on cloudy fuel and get repeatable results. Engines that are being run on cloudy fuel will run very erratic causing the tuner to waste a lot of time looking into other areas and arriving at non conclusive tests. 100 LL avgas is famous for not mixing well (cloudy jar test) when using castor based premix oils especially when the fuel temperatures drop below 70 deg. F. In the USA, mixing about a 1/2 gallon of pump gas into 4 to 5 gallons of 100 LL avgas will make the oil and fuel turn crystal clear and not appreciably affect the overall octane rating of the resulting mixture. In the USA, pump gas has ethanol or MTBE as well as who knows what else and the pump gas acts as a good blending agent, making the castor oil soluble in the 100 LL mixture." Note:- a 1/2 cup of acetone to 5 litres of fuel will also do the trick. The cylinder has some "streaking" this can be avoided by using the assemble oil (Elf 909) that we send with each cylinder and carefully following the start up procedure. Alternately you can use gas nitrided steel or titanium oxide coated rings. 3:- KTM125. This bike has been run at 40:1 using a two stroke oil that is not commonly used in the motorcycle industry.It may be ok but I prefer to use brands that are known to be good for the job. cheap oils maybe ok in my weedeater or old Yamaha V50 but I would not put them in a race bike. If the engine manufacturer specifies 30:1 you should mix the oil/fuel at 30:1 or whatever they say. Don't rely on an oil rep., he/she did not design and test the engine. This engine is in trouble. 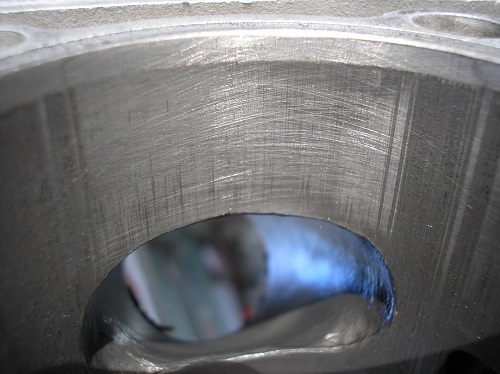 It has had a bearing failure, the bore is worn, especially in the port area, the ring has worn through the chrome coating (see the dusted piston near the top of this page) and has worn side faces and the piston is scored. Compare the piston skirts from these 3 engines, the metal is torn not worn smooth like the dusted cylinder.